James Bond, The Dark Knight. Skyfall, Reviewed. When Casino Royale came out in 2006, it was rightly praised for lots of reasons: Daniel Craig's franchise-rehabilitating turn as James Bond; the excellent action sequences; the fact that it was smart and compelling, unlike a lot of recent Bond movies that had gotten progressively sillier, almost self-mocking. The movie also felt akin to the previous year's Batman Begins, which like Casino Royale rebooted with a dark origin story that showed how its hero got his start, ditching all the kitsch and starting fresh with a no-nonsense, character-driven approach. Because both films were several years in the works, it's unlikely that Casino Royale borrowed from Batman Begins' approach—it was just a coincidence. Nonetheless, the latest Bond movie, Skyfall, further follows Batman's lead: After the lame Quantum of Solace, this new film is Bond's amalgam of The Dark Knight and The Dark Knight Rises. It's no coincidence, either. As with Casino Royale, Skyfall is a mostly self-contained entry in the series that will grow in your estimation if you recognize some of the references being thrown out. (You'll still be thoroughly entertained if you miss them.) With shades of Dark Knight Rises, Bond (Daniel Craig) is this time doing battle not just with a merciless killer but with age. Those around him seem to think he's getting too old to be a lethal double-0 agent. But soon his fading prowess is put to the test when he goes after a mysterious man named Silva (Javier Bardem), whom even those who work for him fear. Silva is targeting MI6 with acts of cyber-terrorism for reasons that are, like a surprisingly fair amount of plot points for a Bond movie, better not to learn until you actually see the movie. For the second straight Bond film, a non-action director is at the helm. But where Marc Forster (Finding Neverland) lost his way in Quantum of Solace, Sam Mendes (who won an Oscar for American Beauty) masters Skyfall, treating it more like a thriller than a conventional action film. (The movie still has its share of superb sequences—in particular, a dazzling one in Shanghai that will please fans of hand-to-hand combat and terrify sufferers of vertigo.) As with Christopher Nolan's Batman movies, Skyfall is partly about Bond coming to terms with being Bond and what it means to be a person whose job it is to protect the rest of us. 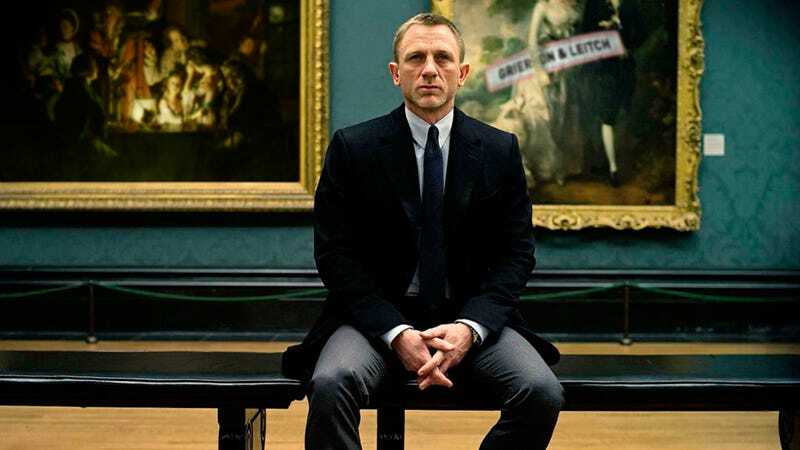 But that doesn't mean Skyfall is endlessly gloomy: Aside from the groan-worthy one-liners in every Bond movie, the film is clever in its humor and twists, with some of the best laughs coming from the inventiveness of the movie's story. Bond traditions haven't just been updated for the 21st century for the sake of hipness—they've been intelligently modified and rethought, giving us the franchise's inherent pleasures in a new package. Most long-running film series, and Bond movies in particular, are only as good as their bad guys, and in Silva, Skyfall has one of the series' most ... interesting. With bleached-blond hair and a creepy, smarmy smile, Bardem plays Silva like a super-genius version of Anton Chigurh from No Country for Old Men: His serene stillness makes you endlessly uncomfortable. At the same time, though, it's a pretty hammy performance. Bardem overplays his character's pouty, sometimes overtly sexual behavior—apparently to make the audience wonder if he's supposed to be gay—and the actor's showy flamboyance is the sort of thing that Craig's realistic Bond movies have mostly avoided, with good reason. And yet, Bardem's flirtations with campy excess give Skyfall a twitchy unpredictability that fuels the overall tension: You seriously don't know what the hell the guy—and, by extension, the movie—is going to do next. It's hard not to see Silva as Skyfall's Joker, a larger-than-life, somewhat unfathomable menace who knows how to push our hero's buttons in a way that no one else can. (Adding credence to the comparison, one of Silva's escapes in this film is very similar to one in The Dark Knight.) But whereas Heath Ledger's performance was masterful and complete, Bardem's feels a little heavy on fun tics. It's not that Bardem acts like he's better than the movie he's in—Mendes just can't quite balance his villain's calmly unhinged evil with the rest of the film's cool craftsmanship. This imbalance never threatens to topple the film, but it does keep it from being as stirring as it longs to be. At heart, Skyfall still has some of the limitations of all Bond movies—they have to figure out ways to shoehorn in all the franchise's familiar faces, catchphrases, and conventions—but like with Casino Royale, the filmmakers doctor the formula well enough. This one isn't quite as great as Casino Royale—it doesn't have an emotional anchor as potent as Eva Green's love interest—but it's a great relief to report that after Quantum of Solace, the Bond reboot is back on firm footing. In other films, Craig has been criticized for his humorlessness, but it's becoming increasingly clear that he's the right James Bond for our times: a dark, conflicted champion of the people who considers the job a curse more than a blessing. In a lot of ways, Craig's grizzled performance embodies the spirit of these rebooted Bond movies—he wants to restore the franchise's eternal cool by stripping away all the fluff that's accumulated over time. He's not the hero this lucrative franchise deserves, but he's the hero it needed. Lots of people were going to see Skyfall out of obligation—how much nicer it is to know going in that it's actually pretty damn good. Grierson and Leitch is a regular column about the movies. Follow them on Twitter at @griersonleitch.